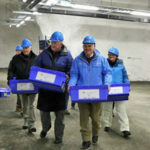 Over 20,000 samples originating from over 100 countries arrived this week at the Svalbard Global Seed Vault in time for the vault’s sixth birthday. The samples include a shipment of Australian seed. The shipment was shepherded by Australians including Australian Grains Genebank Leader Sally Norton, Australian Pastures Genebank Curator Steve Hughes, Victorian farmer and Crawford Fund board member Tony Gregson and, former Deputy PM and former Chair of the Fund Tim Fischer who each made the long haul to the northern part of Norway. And the Crawford Fund supported the first Australian journalist to visit Svalbard, Sue Neales, the national rural reporter for The Australian. Sue’s news and feature items appeared on 1 March in the Weekend Australian. Dr Sally Norton, the Leader of the Australian Grains Genebank said that for the first time Australian indigenous wild seed samples of relatives of sorghum, rice and beans were included along with the canola, oats, lupins and both temperate and tropical pastures. “As Australia is a net importer of crop species, this represents the first deposit of truly Australian indigenous seed material, and is a valuable resource for global food production,” she said. Steve Hughes, Curator of the Australian Pastures Genebank, said they plan to send around 3000 varieties of seed per year to Norway until its entire collection is backed up. “The Australian Grains Genebank and the work of the Global Crop Diversity Trust is vital for food security not only in Australia but also in the world,” said The Hon Tim Fischer, Board Member of the Global Crop Diversity Trust and a former chair of the Crawford Fund, Leader of the National Party and Deputy Prime Minister. Dr Tony Gregson, a member of the Fund’s board, was making his second trip to the near Arctic Circle and has been a long-term supporter of conservation of crop genetic diversity. Drawing on a global coalition of governments and private donors, the Crop Trust is building an Endowment Fund, which will safeguard the diversity of the major food crops of the world in genebanks when complete. Australia was an early supporter with funding from the Australian Government and the Grains Research and Development Corporation. 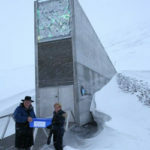 The seed vault is a backup, housing duplicates of the living crop diversity collections kept in “genebanks” around the world and widely and regularly shared with plant breeders.